When we write our measures or KPIs as two- or three-word phrases, like Customer Loyalty, Employee Engagement, Turnaround Time and Sales Call Efficiency, it makes it impossible to implement or report them properly. This recipe for writing quantitative measures or KPIs fixes the problem. The trouble with writing a measure or KPI with just a few words is that it leaves too much ambiguity about how exactly it is calculated. You don’t have a real measure until you’ve articulated how its values will be calculated. And that means we need to know how to clearly write quantitative KPIs and measures. We can’t leave our measure calculation to chance like this. The solution is quite simple, and involves a 4-part recipe for writing a quantitative KPI description to accompany our usually-vague KPI names. Part 1 of a quantitative KPI: the statistic. Decide what the best form of summary statistic is to turn the raw data into the values of your measure. You have lots of choices: number (count), total (sum), average, median, percentage, maximum, minimum, range and so on. Order Turnaround Time: Average number of days from order request to order delivery, for completed deliveries, calculated weekly. Part 2 of a quantitative KPI: the performance attribute data item(s). Clearly identify the data item, or data items, you are applying the statistic to. What exactly are you averaging? What exactly are you counting? What exactly are you taking a percentage of? Commercial Waste to Landfill: Percentage of tonnes of waste produced that is sent to landfill, for commercial organisations, by month. Part 3 of a quantitative KPI: the scope data items. Scope data items define the extent of the performance area that the measure should relate to. They define what to include in the measure, or what to exclude. You can imagine in a data set of all customers, there might be a field that flagged how the customer found out about the company. One of the values of this field could be ‘existing customer’ (other values might be ‘web search’, ‘TV advertisement’, etc…). Part 4 of a quantitative KPI: the temporal data item. Contrary to popular practice, the frequency with which you measure something should not be chosen to align with reporting time frames. Just because you have a monthly report does not mean your measures’ values must all be calculated monthly. The frequency of your measure should be chosen as frequent enough to detect signals as soon as possible, but not so frequent that your signals drown in noise. Measures with too low a frequency tend to give very dull or delayed signals. New Website Visitors: Number of new website visitors by week. 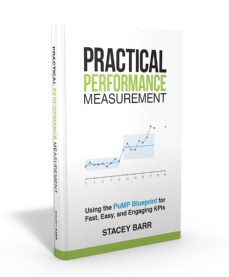 Is writing a KPI or measure really that simple? Well yes, and no. You need to follow this 4-part recipe as the framework of writing a quantitative performance measure or KPI. But your performance measure might have a more complex calculation that needs more than one statistic, or several performance attribute data items, or a few scope data items. International Training Gross Profit Margin: Total sales revenue less total cost of sales, expressed as a percentage of total revenue, for all training workshops that are held internationally, by quarter. When we write our KPIs and performance measures quantitatively, with this 4-part recipe, it’s easier to work out what data is needed and how to turn it into the values of the performance measure. And this means we’ll have a much higher chance of success in bringing each KPI to life – the way we intended it to be. Share your performance measure descriptions below in the comments, and explore with me whether this 4-part formula really does work… or not.